Come to discover the pleasure of surfing or to improve and perfect your skills, in our school, officially recognised by the « Fédération Française de Surf et Qualité Tourisme ». They will also share with the student their experience and passion for the sport. Our school offers a wide range of course options, ideal for beginner to advanced surfers, surf camp weeks during the off-season and the rental of surfing gear. This area offers some of the best waves for surfing in the world ! The beach, north of Seignosse Le Penon, is the perfect balance between the relaxing nature and wilderness, typical of the Landes and the proximity to a beach resort and its facilities. Our 5-day course is the most commonly chosen formula by our surfer students. Overall, it’s our most interesting formula. It’s ideal either to start off to acquire solid foundations or for a good, smooth progression if wanting to improve your technique. We also offer other course formulas to best suit your expectations and goals. 5-day course in groups of maximum 8 people. 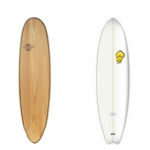 All the necessary gear, board and wetsuit (steamers or spring suits) are included in the price. Master the basics (stand up, paddling, balance, speed, trajectories and technical manoevers…up to tube riding !). – Increase the knowledge and understanding of the surrounding element (choice of waves, sand banks, the trough, rip currents, dangers, weather conditions). Coaching is done by experienced surf instructors, holders of a « Brevet d’Etat en surf » and a « Brevet de Maître Nageur Sauveteur Secouriste ». After the lesson, students have the option to keep on practicing with the same gear used in the class at more convenient rates. The teaching process adopted by our coaches with kids revolves around a few simple principles : Fun, games and security. From the basic one-time class to the 5-day course, we adapt our courses and teaching methods to suit each child, through a playful and secure approach and establishing personal goals. For their comfort and to improve in good conditions, every child is equipped with a foam board and a full-body wetsuit. The school license issued by the « Fédération Française de Surf » covers every student in a lesson with a third-party liability insurance. If weather conditions are considered not appropriate or dangerous for the safety of the students by the coach (e.g. thunderstorms), the class will be re-scheduled or re-reimbursed. The lessons and courses are given in and around Seignosse, Hossegor and Capbreton all-year round; during summer, from June till September, you can find us on the left of ‘The Casernes Beach’ when facing the sea. – Increase the knowledge and understanding the surrounding element (choice of waves, sand banks, the trough, rip currents, dangers, weather conditions). -Coaching is done by experienced surf instructors, holders of a « Brevet d’Etat en surf » and a « Brevet de Maître Nageur Sauveteur Secouriste ». – After the lesson, students have the option to keep on practicing with the same gear used in the class at more convenient rate. Interested in arranging, planning a surfing experience in Seignosse for a school group or association, a group of friends, a numerous family, a birthday, a special event, a bachelor Party or a bridal shower ? We invite you to develop together the project that best suits your expectations and to share with you a unique, unforgettable experience. Surfing gives us the chance to sensitize future surfers and build awareness for the environment, the beaches and have a better understanding of the ocean’s functioning. The group tariff starts at €25 per person. Contact us and we’ll give you a more precise estimate. We also feel it is important to go beyond the pleasure of surfing by bringing awareness to our surfer students of how to protect and respect the environment and its fragile eco-system and to strengthen their knowledge and understanding of the surrounding features (wave formation, how to evaluate a surf spot, spot sand banks and rip currents…). 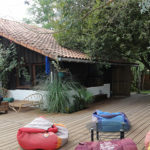 Participants will stay in comfortable cabins/lodges accommodating between 4-5 people, in a natural setting, in which you can also experience the charming peace typical of the Landes. Our surf camps happen twice throughout the year, at Easter time and Halloween. These are good periods of the year, since it’s not crowded and during which we are best able to take you on the wave hunt in and around places like Seignosse, Hossegor, Capbreton, Biarritz, Hendaye.